By 9:30 a.m. there are already people holding signs, setting up lawn chairs and ready to wait several more hours in hopes of catching a glimpse of the president's motorcade. Some folks are there to show support for President Obama; others are there to be outraged, wary of the looming specter of socialism and the rising national deficit. "I'm a disgruntled taxpayer," says Glenn Wood, a grandfatherly fellow holding a fluorescent pink sign promoting smaller government. Also in attendance are environmentalists upset about the billions of dollars being given to help expand Plant Vogtle, as well as parents whose children are serving in the Middle East, and people who have nothing better to do on a Tuesday morning than witness a spectacle. 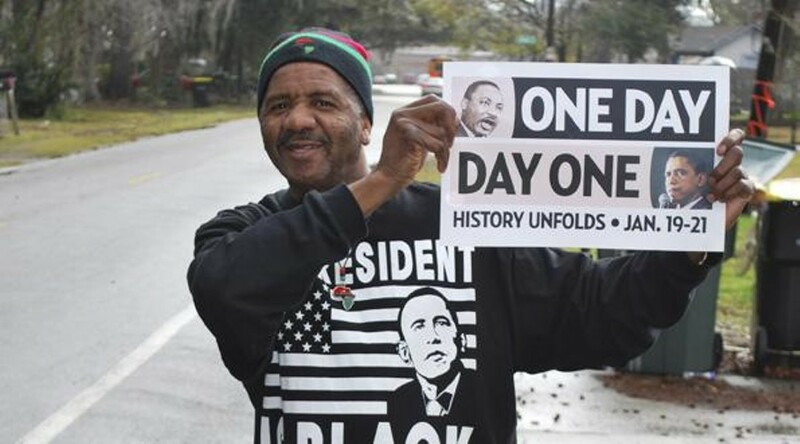 While groups gather along White Bluff, around the corner on Hampstead, Oku Graham is wearing an Obama T-shirt and holding a sign supporting the President. "Everyone else is gathered on White Bluff. Do you think he's coming this way?" I ask. "Oh yeah," he replies. "He's gonna land at the base and come right over here." The sky's overcast and the air's damp. It rained an hour ago, and more's on the way. If Obama does pass by Graham, it won't be for nearly three more hours. Several hundred yards away, on the other side of two security checkpoints, and well in view of the secret service agents on the roof with binoculars, stands a line of several hundred people - invited guests ranging from state and local elected officials, business and community leaders, and members of the media - all waiting to enter the building. The energy in the line is palpable. The President is coming, and here stand all the folks with golden tickets. There are handshakes, back slaps and cajoling. There are pensive looks toward the rain clouds followed by glances at wristwatches and cellphones to see how much longer the wait will last. To get inside, security will be served airport-style, "except you can keep your shoes on," a young man with glasses tells us. There's only one metal detector, and we all must pass through it. Looking down the line, there are plenty of familiar faces. It's immediately clear that this is a crowd with money, and not all of it supporting Democrats. In fact, much of it doesn't. According to Federal Election Commission data, campaign contributions of four notable attendees - local bank presidents, CEOs and so on - reveals over $20,000 in donations to McCain, Bush, Chambliss, Isakson and others during the last two elections, without a single dollar given to a Democrat. Local Republicans made up a surprisingly large portion of the audience. Who sets the guest list for a presidential visit? Judging by the crowd, it was clearly not done for the people, by the people. Obama could've packed the Civic Center. Apparently, the president's visit is not a gift to his supporters, nor an opportunity to thank local Democrats for their efforts. 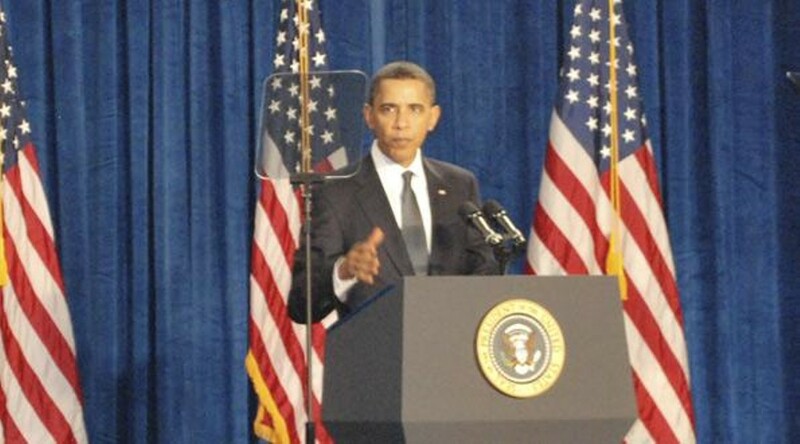 When he appears, Obama will stand in front of a crowd of people, many of whom, until they arrived here smiling, were probably commenting about the negative side of healthcare reform or the stimulus. Representative Jack Kingston is in attendance even though he's voted against all of Obama's signature policies, and two years ago railed against Obama the candidate for not wearing an American flag pin during the campaign (Kingston wasn't wearing one either when he made the remark). He's smiling. This is politics. Although Georgia is a "Red State," the Savannah area remains slightly left of center, just the way Pinkie Masters wanted it. It seems a shame in this one liberal enclave, where Obama's victory meant so much politically and racially, that the entitled few are the ones who made it through the door to see the man in person. There's still over an hour before the President is due to appear on the well-lit stage at the front of the room, but the energy is frenetic. 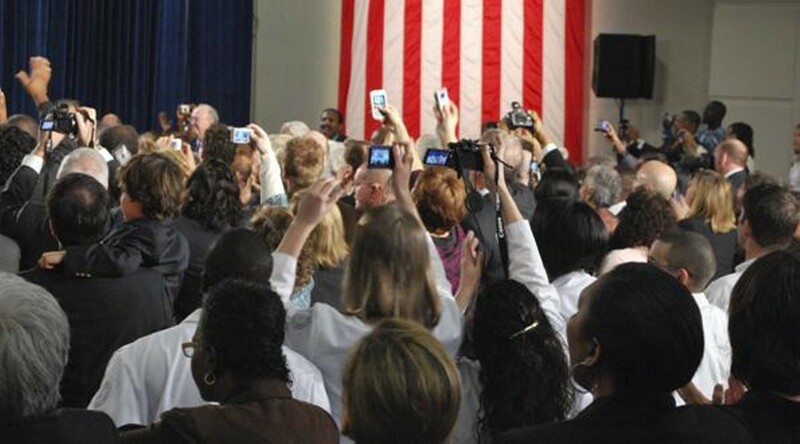 Members of the media scurry about setting up cameras, jockeying for space on risers and thumbing through e-mails on Blackberries. This is the big story today. There are TV crews from network affiliates in Atlanta, photographers from Florida, writers from Washington D.C. But is this really as big a deal as we want it to be? There's still traffic on the streets. Banks and post offices are open. Everyone who isn't in this room is going about a fairly normal day, except that the president's arrival has been the foremost topic of conversation. A man in a suit steps on stage. The room immediately goes quiet and the audience is seated. There's at least 26 minutes until the president is supposed to arrive. "Someone has lost a set of keys," the man says. "It looks like a Toyota. If you want to claim them, we'll have them in the back." After the announcement, everyone stays seated, whispering now instead of talking. Many thought that was going to be the moment we were all waiting for. There is a smattering of chuckles. Cutting through the relative quiet, a broadcaster from Atlanta has to do a live introduction - the room goes silent while listening to him set the scene, describing everyone who's in the room. We all listen like we might be mentioned by name. Awkward doesn't begin to describe it. The mayor walks in and receives applause. Obama must be close. The governor enters and a handful of people give a polite golf clap. There hasn't been any good news about the state budget. For more than 30 years, whenever the Godfather of Soul James Brown stepped on stage, he was announced by Danny Ray. When he leaves, 20 minutes from now, it will be set to pre-recorded music - canned fanfare. Meanwhile, across town, Secret Service agents guard a supply of the president's blood over at Memorial Health hospital. It's funny how the federal government chooses to spend money. You can hardly hear the end of the announcement because immediately everyone in the room takes to their feet and begins to applaud and cheer. Half the people are clapping, the other half are trying to snap photos as he walks toward the stage. It's not easy to tell who's Republican any more. On the risers where the media stands is a flurry of clicking camera shutters and TV reporters calling the play-by-play. I've never been in the same room as the President of the United States. Most people haven't, but a few people spend several hours a day with him, or near him, or facilitating his movement from place to place. One of those groups is the White House press corps, who all sit in a room off to the side of the auditorium, watching a live feed of what's actually happening, typing furiously. There is little conversation, but plenty of coffee. A tray of danishes sits nearly empty on a table at the front of the room. They do not share in the excitement bubbling on the other side of the wall. They've seen this before. Although he's nearly consumed by the crowd, it's clear that Obama is in the room. Standing under the lights, he looks just like he does on TV. It's actually sort of surreal. 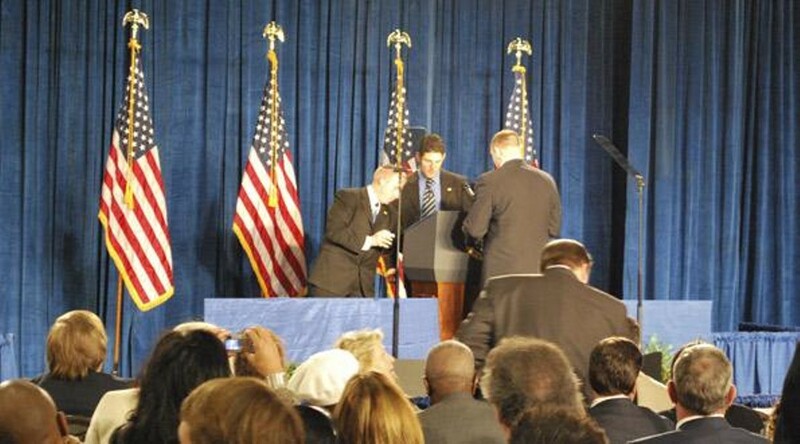 As Obama steps offstage, it's like hitting rewind on a VCR and watching the entrance played back in reverse. The crowd jumps to their feet. There is applause and cheering. Unlike the first time around, now there is rapturous elbowing for position. Some of the chosen few will get a handshake. They might be healed. "I got to touch him," says one local elected official who has survived the stampede and made his way to the back of the room. There's no denying Obama's rock star qualities. He's an engaging speaker who manages to tread the thin line between personable and academic. He is the smartest Everyman. "He's energizing," says a passerby. The itinerary for today is tight, and Obama can't stick around long afterward, but at one point the room seems ready to start chanting encore. Some members of the media begin collecting quotes from other politicians in the room. Others record their closing remarks and recap all that they have just seen. Finally certain that Obama will not reappear on stage and perform "Freebird," the audience begins to filter out toward the parking lot to wait in the procession of cars that will take them back to the day already in progress. A few miles away from Savannah Tech, I sit alone in a restaurant eating lunch. There's no sign the president is visiting today. There's no news on, and the conversation around me wanders from Ultimate Fighting to the preferred dipping sauce for fried okra. The president is at Mrs. Wilkes eating a proper Southern lunch and joking to a room full of reporters and cameras not to tell Michelle about the fried chicken or mac ‘n' cheese. She's campaigning against obesity, and after a physical yesterday, the whole country knows Obama's cholesterol is higher than it should be. It's clear to everyone involved that this meal will get more coverage than his speech. You can turn on the TV and watch the president deliver a speech, but you can't understand how much of a circus the whole thing is until you've been there. Seeing this on TV is like looking through the peephole of a hotel door and saying you've seen the hallway. I'm stuck thinking about the crowd, and how many people would have liked to have seen the president today. Most of them were absent. 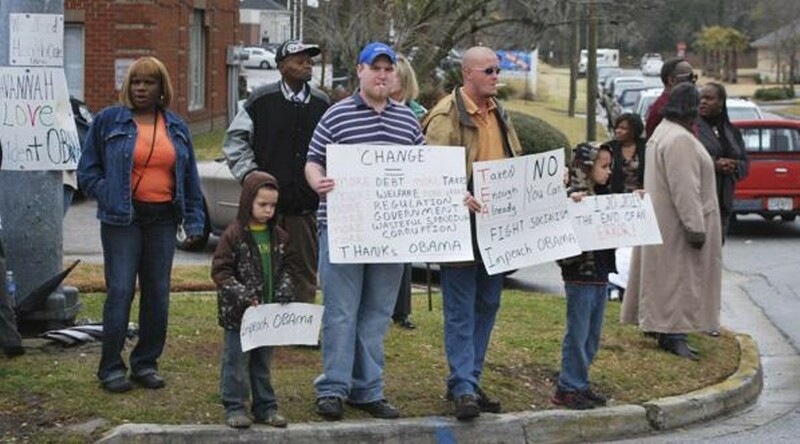 When he was elected, Obama was his own kind of stimulus for Savannah. He gave kids hope that they really could grow up to be anything they wanted. He gave old folks faith that the struggles of the Civil Rights era had indeed paid dividends. He also drove merchandise sales at every shop and road side stand peddling T-shirts and assorted commemorative items with his face on them. But what does he owe the average person? What does he owe the volunteers who gave up their lives for a few weeks or months to help him get elected? Maybe nothing, but doesn't he work for "We the People?" Shouldn't he meet with the shareholders, not just the board members? Very few of those folks were in attendance. Most of the ones that were had to stand beyond the security perimeter, braving the cold and the rain while the business leaders, union members, lobbyists and politicians sat inside. It can't be ignored, because it seems too much like a metaphor for how the federal government works these days.